Photography is a lot like jazz. Some of the best shots are unplanned — random moments that blend the right time and place with the photographer’s skill for instant improvisation — a deft manipulation of light and angle, an eye for emotion. lampshade © 2003 Alan Lake. All rights reserved. The culinary arts also contain elements of improvisation. Photography is like jazz, which is like cooking. Perhaps there’s a thread that links the senses and connects artists of all media. That may explain why Alan Lake, a professional jazz musician and chef, found himself snapping pictures at the Carnival of Venice last February. Those photographs are now gracing the walls of the Stonewall Library in Fort Lauderdale. Lake was literally an accidental tourist when he arrived in Venice. He had just completed a three-month temporary job in Zurich, where he worked as a chef at the exclusive Pur Pur restaurant. After touring Tuscany for three weeks, he decided to drop by the city of canals and gondolas. “I just happened to land there during Carnival,” he says. 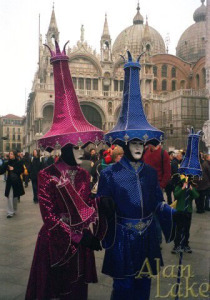 “I didn’t even know it was happening.” After getting a taste of the vibrantly colored costumes and activity-packed campi (small squares or open areas), he ran back to his hotel, grabbed a borrowed camera and set out to seize some moments. “I played like a National Geographic photographer on assignment,” he says. The son of Russian immigrants, he grew up in Chicago, where his family owned a women’s clothing store. “We used to go to New York a lot to shop for clothes, and we would visit the Gugenheim. My parents encouraged an appreciation of the arts and culture. I really got into the Frank Stellas and Monets. boys night out © 2003 Alan Lake. All rights reserved. But his first love was the audio arts—specifically percussion instruments. Lake, 48, started playing the drums at age nine. He took courses at the San Francisco Conservatory of Music in the 1970s, and later took private lessons from some well-known musicians. Lake says he plays 60 different percussion instruments and writes lyrics. He creates “sample sounds,” which are then mixed into music. He has provided percussion sounds for several Madonna records, including “Who’s That Girl,” “Like a Prayer” and “True Blue.” He has also worked with the famous producer Pat Leonard. “I shape air for a living,” he quips. He has also shaped some tasty dishes, as executive chef and food and beverage director at the Sunset Marquis in Los Angeles for 2 years. His specialty is garlic, and he is the author of The Garlic Chef’s Cookbook, which will be released November 1. 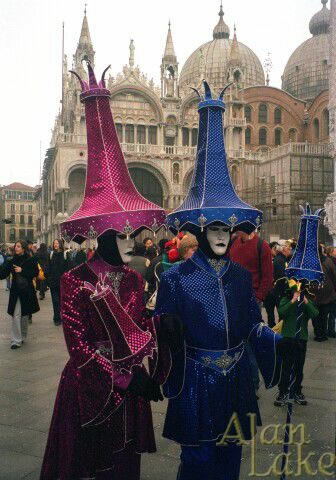 The effect is eye-pleasing, as the rich colors of the custom-designed costumes really stand out. 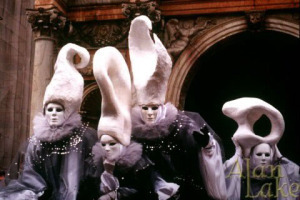 The world-renowned Carnival of Venice dates back to the Middle Ages. Centuries ago, only members of the nobility were allowed to wear masks. Today, the activities include theatrical performances and an array of ancient games. Although he has worked 9 to 5 jobs in the past, Lake now enjoys his life as a freelance musician and chef. He recently had a four-month gig as a chef in Japan. He is one of a new breed of renaissance men.